Check our cheap flights from Australia to discover Nepal’s largest city, Kathmandu, with cheap flights from Globehunters. Kathmandu was once a very popular destination in the 60s and 70s, when people would flock here to seek spiritual enlightenment. While it might not quite be the hippie mecca it once was, it’s still a magical place to visit and the starting point for those who are embarking on a trek into the Himalayas. The city itself is full of beautiful temples and monuments, with Durbar Square serving as the city’s historic and cultural hub, which is a World Heritage site itself. In the square, you’ll find the old Royal Palace, and in the surrounding area, there are about 50 ancient temples, including the Kasthamandap, which gives Kathmandu its name. Venturing out of the city itself, you can see the Kathmandu Valley, which is home to seven World Heritage sites, including the Swayambhunath stupa, also known as the Monkey Temple, which as you can probably tell from the name is home to a group of holy monkeys! 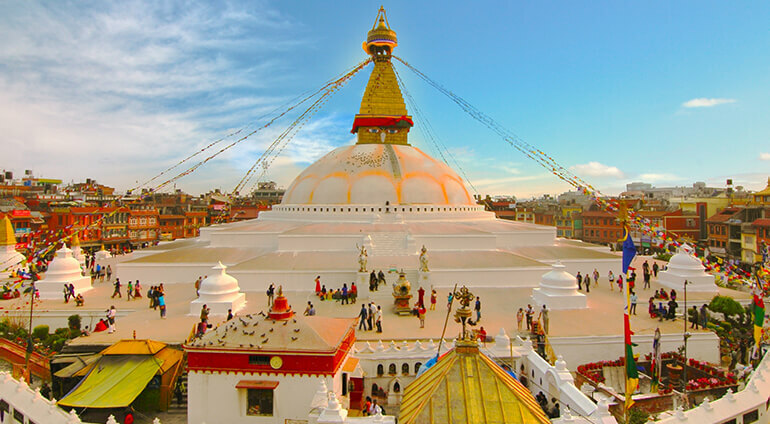 Whether you’re a spiritual person or not, Kathmandu is a truly magical destination that you won’t forget in a hurry, so be sure to check out our cheap fares from Australia below! Weather: Warm, with average summer temperatures of 28 to 30°C and averages of 10°C during the winter. If you’re flying to Kathmandu from Australia, here’s everything you’ll need to know, including flight times and entry requirements. Unfortunately, there are currently no direct flights from Australia to Kathmandu, so you’ll have to stopover at airports in India, China, Thailand or Singapore. Indirect flights depend on where you’re travelling from and where you’ll be stopping over and can take anywhere from 14 to 23 hours. Australian citizens will require a visa to travel to Nepal, and you can download an application form here. You must also make sure to travel with a passport with at least six months validity. Located about six kilometres from the city centre, Tribhuvan International is Nepal’s only airport. Sajha Yatayat buses connect the airport to the city centre, or you can catch a metered or prepaid taxi, which will take around 20 minutes. If you’re looking to head to Kathmandu, whether it’s to tackle the Himalayas or explore the city’s wonderful temples and palaces, be sure to compare fares here at Globehunters to ensure that you get the best possible deal, not just on your flights, but also on hotels and car hire. Speak to one of our friendly and experienced travel consultants, who will be more than happy to assist you.